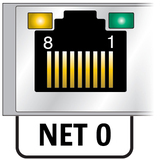 Four RJ-45 Gigabit Ethernet connectors (NET0, NET1, NET2, NET3) can be accessed from the rear panel. The Ethernet interfaces operate at 10 Mbit/sec, 100 Mbit/sec, and 1000 Mbit/sec. These ports enable you to connect the server to the network. Note - Using the Oracle ILOM sideband management feature, you can access the SP using one of these ports. Refer to the Servers Administration for instructions.